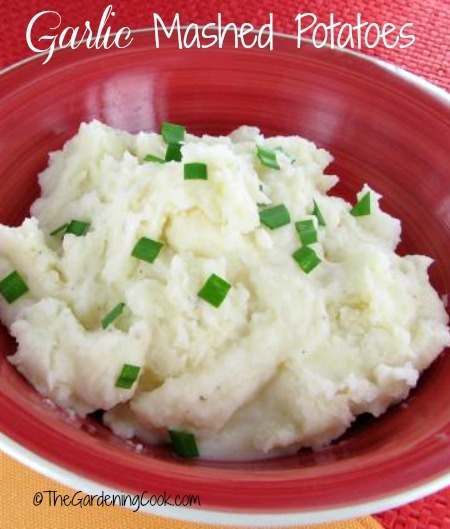 This recipe for creamy garlic mashed potatoes is a slimmed down version of the original recipe. Light sour cream and skim milk are the secrets to keeping the fat in check but not losing any of the flavor. The potatoes are cooked with garlic cloves in fat free chicken stock to give additional flavor and then mashed and made creamy with skim milk and reduced fat sour cream. They are just delicious. For an even sweeter taste, try roasting your garlic first. 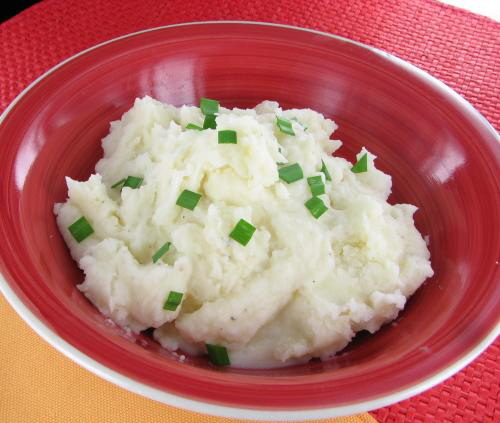 It brings out the natural sweetness of it and is a fabulous addition to the creamy mashed potatoes. More recipes on The Gardening Cook on Facebook. Place potatoes and garlic in medium saucepan; add enough chicken stock to cover. Bring to a boil. Reduce the heat to medium-low; cover loosely and boil gently for 15 to 20 minutes or until potatoes break apart easily when pierced with fork. Drain well. Mash potatoes and garlic until there are no lumps left. Add salt, pepper, milk and sour cream; continue mashing until potatoes are smooth.